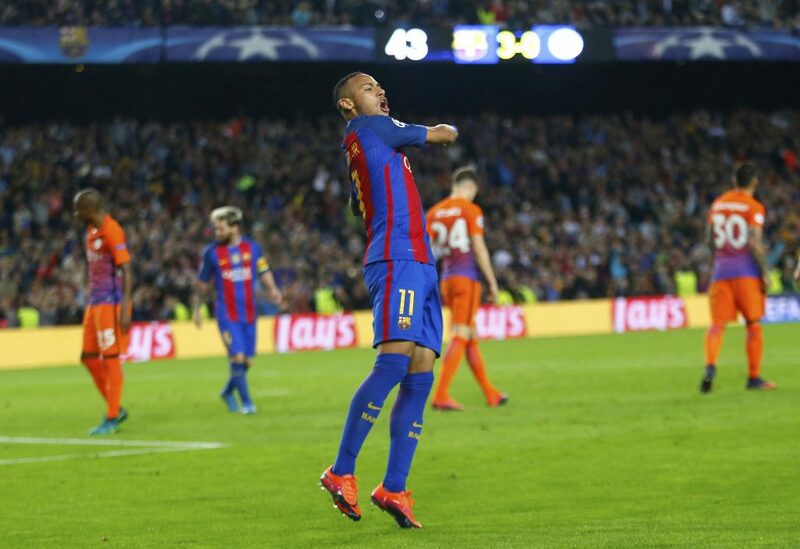 Match Review: FCB vs MCFC, or Much ado about…something. Hey Guys. First, my apologies: this post is about 3 days late; I needed some mind-cleansing after watching some stupendous football. My editor has been on my arse, so I’m back now; raring to go. Let’s go back in time, precisely 4 days back…. I absolutely love football. It is so diverse, so beautiful. Barcelona vs Manchester City was the kind of game that you watch and you just smile a lot and people wonder if you are going nuts. 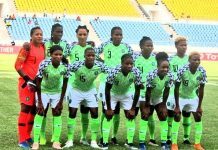 It was a group stage game, so I didn’t really expect fireworks and the razor-sharp levels of intensity. Yet, it was Pep, back at The Camp Nou, with a different team. Both teams are still trying to get into rhythm, City more so. A safe, tactically nuanced game was expected, and boy did it give us more! Barça won 4-0, but as in many games, the score line didn’t fully reflect the texture of the game. As a matter of fact, (and stats), MCFC created more chances, had more shots on goal and an almost equal share of possession…up until Claudio Bravo decided go mad in the 51st minute. They’ll call it ‘a rush of blood to the head’. I call it a madness. Hands are used exclusively inside the box, Claudio. Pep’s omission of Kun in order to add an extra body to the midfield seemed to be working. Zabaleta was basically a 4th midfielder, when City were in possession. Barca’s 1st came as a result of an unfortunate Fernandinho slip, and Messi’s perseverance: he kept moving even though it looked like a clearance was 100% sure. He got to the ball, put Bravo on the ground and scored. City had chances to even the score – Silva played in Nolito, ter Stegen got in the way. Gundogan skipped past Pique (who was carrying a knock, by the way) and ter Stegen pulled off a smart save. John Stones headed wide when it was easier to score. Barça also should have doubled the lead. Suarez hit the side-netting and Rakitic should have added to his goal tally when he got on the end of a Messi FK. Bravo had to react amazingly after he had only half-saved Suarez’s weak effort, tipping over the bar. So, up till the Bravo madness, the game was fairly even. It can even be argued City had the psychological edge: Barça lost Alba, then Pique to injuries, altering the dynamics, albeit briefly. Digne, who has proven to be a capable alternative, came on for Alba and Jeremy Mathieu replaced Pique. After the sending off, the game was over. Messi got a 2nd with a well-placed shot, and the 3rd came courtesy of a loose back pass from Gundogan. Suarez picked it up, had just the keeper to beat, was yet to score, but still squared it for Messi. Suarez. Top lad. Neymar continued the Barça tradition of missing PKs after Messi was hacked down while doing Messi things. He made up for it though, getting the 4th, destroying Stones in the process. Neymar Jnr capped a good solid performance with a well-taken goal. Pep is a victim of his outrageous success. It is AMAZING how we have evolved as a species and people STILL think Josep Guardiola is a fraud. Gist for another day. This defeat is on him, absolutely. Leaving Kun out backfired spectacularly. After losing a GK, 1-0 down, 9 out of 10 managers would make changes to lock up shop. Two lines of blocks, 1 player up front, or none even. Not Pep. He will adhere to his (working) style till the day he retires. He is as stubborn as he is successful, and to be fair, 9 out of 10 managers didn’t win 6 trophies in their first season. Actually, no manager has done that. Benefit of doubt well earned, no? 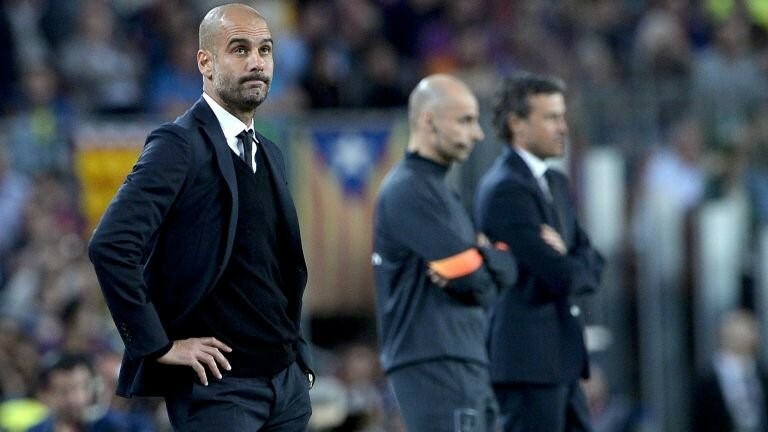 Quick footnote: There was a lot of talk about how Pep matched Lucho tactically. Hilarious garbage. Do you do a tactical review of a half and use that to represent the whole game? You cannot tactically match your opponent and lose by 4 unreplied goals. It doesn’t add up, sir. Lucho doesn’t get nearly enough credit. It is easy to tow the ‘he has MSN; he just has to show up’ line. So myopic, it makes me sad. Lucho has carefully created another type of monster. We saw spells where City did all the passing and cute triangles, while Barça had no problem going long or hitting them on the counter. Iniesta has been re-invigorated, Mascherano had an excellent game…at right back. Almost like he was rewarding the club’s faith in him for the contract extension few days prior. This Barça team have evolved, and Lucho has been at the helm of this evolution. 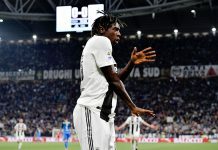 You think it is easy to combine 3 of the best players in the world AND play beautiful football, get results AND keep the dressing room happy and ego-free? Think again. 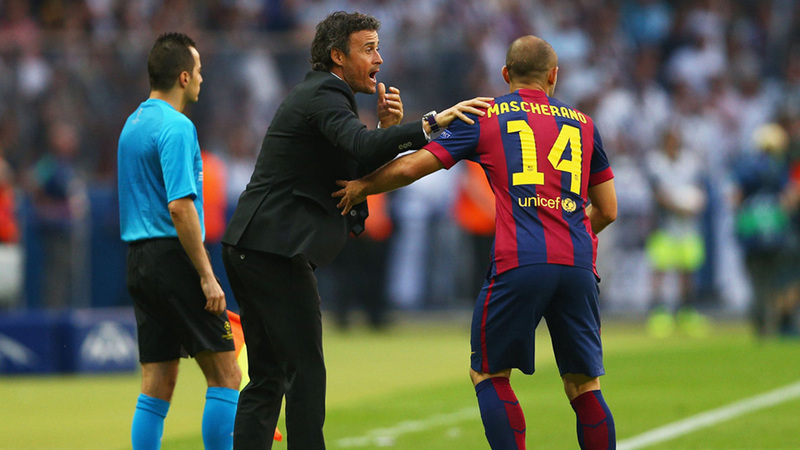 Lucho has a loyal warrior in Javier Macsherano. MCFC played vs a Barça team that is still one of the best in the world, home to the greatest player probably to ever play the game. After all the smoke and fang-bearing at Pep, truth is this Barça team is ridiculously good. Messi isn’t 100% yet, and Neymar seems to play his best football when he isn’t sporting a hair-do that looks like it is straight out of the mad hatter’s style collection. Also important to mention here that while it is easy to focus on the front 3, this writer is still of the opinion that the heart of this team is STILL Sergio Busquets. He can be like fine oil, or thick dirty grease, without which this Lucho’s machine will have creaks. Paragraphs can be written about tactical setups, but talent of players will often shine through. Manchester City still adapting to Pep. It is coming, and it will come. We have seen flashes of it already. City will surely imbibe Pep’s style, but he needs to do it fast. The EPL is not a kind mistress, and you will suffer if you don’t do your homework, quickly. It’s 4 games without a win in all competitions, and it is indeed worrying. Too early to be termed a crisis, of course. Reality check? He hasn’t won in 4 games in all competitions. So, there you have it. The return game at The Etihad should be fun. Any bets on Kun being left out again? I’ll take your money!